Wakanda is forever, but Black Panther’s reign atop the U.S. box office had to end some time. After a more than respectable five-week run as the No. 1 movie in America, this weekend the Marvel superhero adventure fell to No. 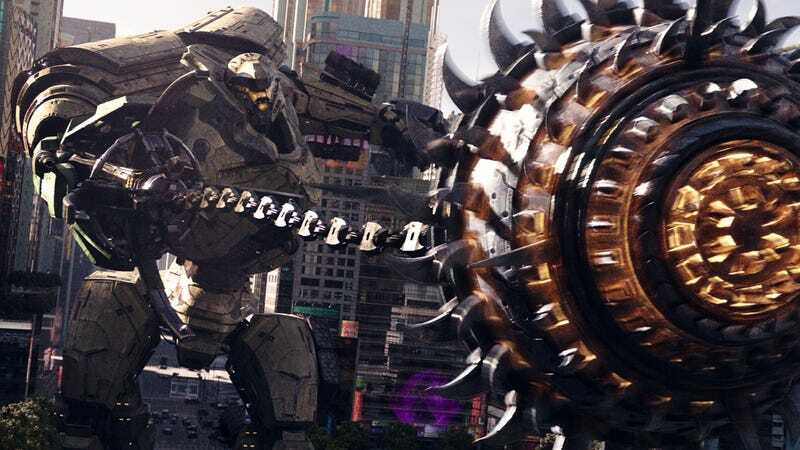 2, replaced by a different sort of nerd bait: The giant monsters vs. giant robots smash-‘em-up of Pacific Rim: Uprising. Despite mostly negative critical reviews describing it as a hollow simulacrum of the original Pacific Rim, the rock ‘em sock ‘em sequel landed comfortably at No. 1 at the domestic box office this past weekend, pulling in $28 million to Black Panther’s $16.6 million. That’s okay as far as tentpoles go, but Pacific Rim’s real target audience has always been overseas. Case in point: It made nearly three times as much in China, where it debuted this weekend to $65 million. That’s better than the first Pacific Rim, which went on to be a blockbuster in the PRC, so Universal executives probably aren’t too worried about a so-so American opening. Even with strong ticket sales in Asia, though, Pacific Rim: Uprising still has a long way to go to even come close to Black Panther. The latter film has made a staggering $630 million at the domestic box office, enough to make it North America’s highest-grossing superhero movie of all time and put it in the top five of all time overall. As we mentioned over the weekend, at this point Black Panther, currently at $1.2 billion internationally, only has about $300 million to go to beat The Avengers’ worldwide record of $1.5 billion; it’s already surpassed its predecessor’s $623 million domestic total, with at least a few more weeks in U.S. theaters to go. Continuing to overperform in its second week in theaters is the faith-based music biopic I Can Only Imagine, holding strong at No. 3 going in to the pre-Easter Holy Week. Notably, the film’s per-theater average dropped nearly 20 percent from last week, a difference that was mostly made up by an expansion onto 624 additional theater screens. (The film opened with $17 million, and made $13.8 million this past weekend.) Presumably, some of that attention was split by the debut of Paul, Apostle Of Christ, another faith-based film hoping to benefit from evangelicals’ willingness to sell tickets from the pulpit. That period Biblical drama debuted at No. 8, playing on less than half the number of screens as its more contemporary counterpart. The weekend was much less miraculous for the rest of the new wide releases, with Sherlock Gnomes faring the best at No. 4. Midnight Sun and Unsane, meanwhile, both limped through their opening weekends at No. 10 and No. 11, respectively, each with a less than $2,000 per-theater average on just over 2,000 theater screens. Things aren’t looking great for Tomb Raider or A Wrinkle In Time, either, both of which dropped more than 50 percent to come in at No. 5 and No. 6 in their second and third weeks, respectively. Perhaps unsurprisingly, the big winner in limited release this weekend was cult favorite director Wes Anderson’s Isle Of Dogs, which pushed past online discussion about cultural appropriation in the Japan-set film to make $1.5 million on a mere 27 screens. That’s a $58,148 per-theater average, the best not only of the weekend but also the year so far. That one will be expanding into new cities this weekend—as well as adding screens in cities where it’s already playing—before going nationwide on April 13. Is Isle Of Dogs one of Wes Anderson’s best movies, or just his most overtly political?